Very bad update to the Media Module. We don't want to see old news. Also, many news articles may not be noticed, especially from newer players who don't have any friends to share it to. This change needs to either be reverted or changed, time has to be the most important factor. Another problem is that it is way too easy to abuse this system, since number of comments (or possibly recent comments) seems to be one of the most important factors. comments and endorsements then votes - there is no way you can code quality unless perhaps you search for certain words. like country names etc. 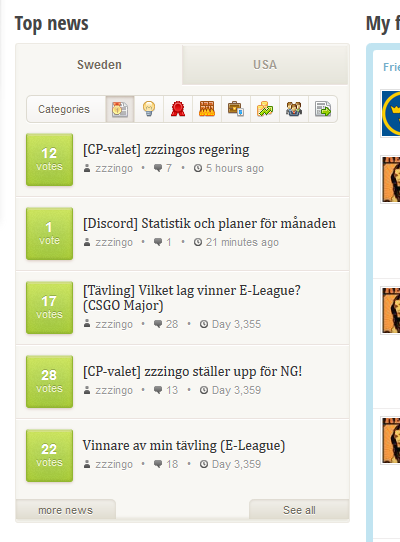 Articles from the last 2 days should always be on top, sorted by votes. Older articles could then follow. The change it's not that bad, but older articles should lose relevance much faster. One controversial article and it will be there for weeks. i read article 6 years ago ))))) realy an improvements????? probably no. 30 min old article was 27th in the list with 1 vote. I left second vote and 9 comments on article. Now it is 1st article in the list. I respect your attempts at making this game better, but please just listen to your players. This update should be revoked, and more updates like this should be replaced by updates that the players want. Also, you obviously want profits, a update people want will spark more buying, and less aggression towards developers. Just one update could send this game out of the dumps, and back in the right direction. If we are suggesting other improvements the economy could use another week of higher consumption via a bonus +900 energy House for like 10 days or maybe a month. Like we did during the 9th anniversary. It has been said before. The idea isn't terrible. The execution of it is. More focus on age of article, Older articles should not be in the top 5. More focus on amount of votes and endorsements. Also bring new articles into spotlight. For example create an unread articles section, which would be displayed in front of the current list. Let articles stay in there for 48 hours or until the reader has opened it. I have nothing against some articles staying in the list for longer than 2 days. But there should be an option to remove your article from the list. Would be good for battle orders and time sensitive stuff like that. So do it properly or don't do it at all. Edited by Dodo Moron, 06 February 2017 - 11:52 AM. Are we going to hear anything from admins? Around 99.9% of players think the article list system is not functioning as intended. It gets even more annoying as we know there is a easy fix for this BS. Revoke the update. I've said it before. Sort your s*** out. The idea isn't bad, execution of it is. It's a basic calibration exercise and you messed up. Prove to us you are more than just giant apes. Rethink it, perfect the s*** out of this idea. Then implement it. Do it properly or don't do it at all. You do something right for once (country budget is now showing very nice its elements, although I don't understand what "other" means) and you don't make an "Latest updates" announcement out of it?! I did write an article on why the articles sorting system is cancerous and how to fix it. Go read it and share with your community. - Less articles, fewer players are making articles. - Less interest in the articles, for example less number of votes. - More low effort comments. The best solution would be to not allow any articles that are more than 2/3 days old on the top news. I don't think that the sorting is the main problem, but the fact that old articles are staying on top news for days. If there are less than 5 articles written in two days you should let one or more spot on the top 5 be empty, I think it would encourage more articles is less active countries. From a DEAD Citizen Written on day 1350 ( about 3-4 years ago) is on my list of top 5 articles...Good Job! Furthermore, in order to make more content available for you at all times, articles are now ranked based on a number of different factors, such as votes, comments, endorsements and ultimately, age. This means relevant content will be accessible for longer, and low quality content will be easier to filter out. EXPLAIN WHY DOGGOS ARE NOT ABOVE CATS? It seems like eClank and me are the only ones who really approves this update. + And maybe the most important: the update delivered a fatal blow to Voters Club and other systems where good content was harrassed by people paying for votes to top their mediocre articles. Of course, if people are still interested in... ppffffff... votes, they can enter to the media page (the "See All" link) and they will see the articles organized by votes. But now it's great to see good content articles defended by many variables instead of just one, because they are more representatives in measuring participation. + Own vote/comments doesn't count in the calculation, so the writers need to advertise their articles but, as soon those receive votes and comments, they are almost automatically placed in Top 1 in his country media. So the update favors the writing. + Age as factor is also good, specially in people who turn back to the game after long time. In my case, I maybe never had known why aren't Colombia and Argentina friends anymore if old artlcles hadn't been present in the media. + The "Latest Article" option also allow us to see the most recent publications. So we can also identify potencially good articles to be supported. + Total lack of access of minor countries' articles in the International Section. I don't know why it's so impossible for a colombian article to be or remain in International Top despite existing articles in that Top with less votes/comments/endorses. That section looks biased towards Balkans and, hence, it's very complicated to people around the game world get to know your article. Of course, the side effect is that articles need to be advertised to get participation variables and that implies SPAM on feeds and popular articles. I already received 2 FP and I don't blame admins for that, but certainly you aren't making my elife easier as journalist. Besides, as balkan articles are written in languages majority of users doesn't know, that section continues losing interest among the players. I really think a "english language" variable needs to be added to that section to democratize access. + Age as article's variable doesn't solve the problem of lack of a browse or archive engine. As we have eR Search, we also need a "Press Archive" page where we can find articles written within a time range. That's, by the way, would help admins to reactivate interest for the Wiki. Edited by Demonaire, 12 August 2017 - 10:16 PM.